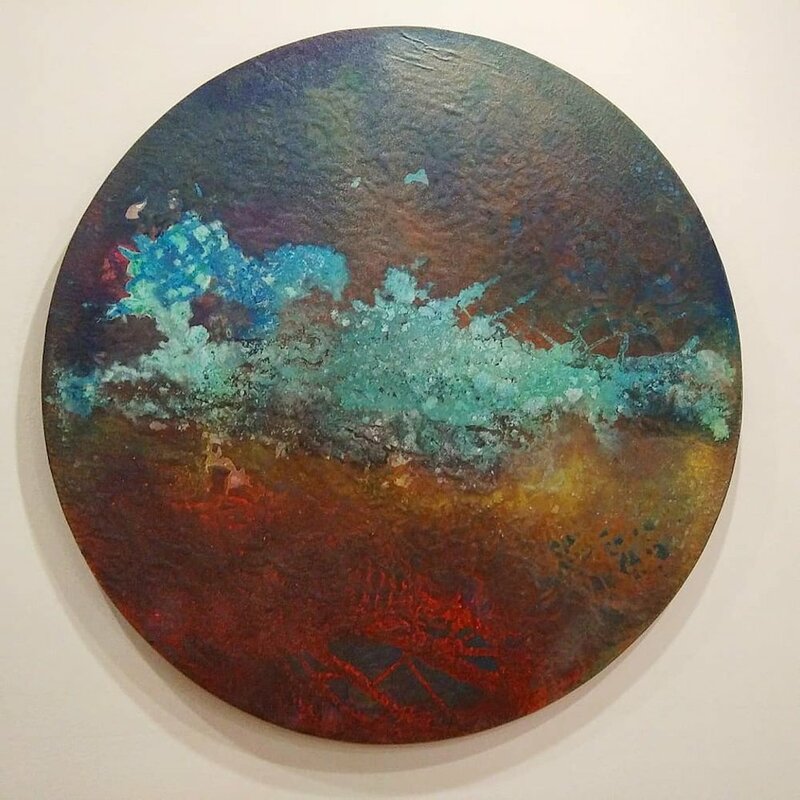 Beautiful Devastation 2017 48" diameter canvas on panel with graphite mica, copper patina, pigment and polymer. The Monterey Museum of Art has invited Monterey-based multi-media artist Hector Dionicio Mendoza to hold a one-month artist-in-residency and mixed-media art project. Excited to have been invited to collaborate on a piece for this show, we created this work together that captures the cycle of wind, water and fire across the California landscape. I gave him a square painting of a moonscape like surface covered with graphite mica and he returned to me a circle formed onto a panel, shifting the boundaries and altering the construct. We applied some layers of color together, mind melding, and then I continued on the process of layering color further. “By simultaneously using the museum as an exhibition space and an artist-in-residence studio, the practice of artmaking becomes more accessible to the public and consequently demystifies how art is created,” says Mendoza. “The project also seeks to add to the current dialogue of how contemporary museum spaces are being used by artists and the public. Mendoza’s residency and art project “Process in Progress,” begins December 28. The public is invited from 11 a.m. to 2 p.m. to stop by and interact with the artist on Jan. 4, 2018; Jan. 5 at the First Friday reception; Jan. 8; and Jan. 15, which will be a screen-printing workshop where the public is invited to participate and learn basic screen-printing techniques on both paper and fabric. The residency closes on February 4, 2018.